Those who explore the Glacier 3000 domain will get up close and personal with the unique nature and store up some unforgettable images. The marked path across the glacier, the Glacier Walk, is perfectly suitable for this purpose. It connects Scex Rouge to the Quille du Diable and is accessible all year round. The hike starts directly at the station of Scex Rouge at the summit. 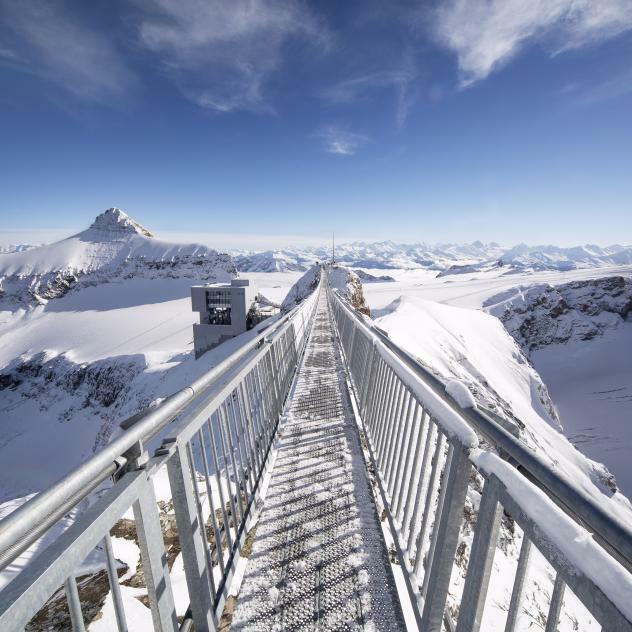 Those who prefer a slightly easier time can descend the glacier using the Ice Express chairlift and start hiking on the snow from there. After one hour you reach the Refuge l'Espace restaurant on the edge of the glacier, near the Quille du Diable. There is a splendid view over the Derborence valley and the Valais. The wide choice of tasty dishes offered at the refuge is a chance for a high-class gourmet pause. By the post bus from the station at Les Diablerets to the Col du Pillon then the Glacier 3000 cable car (Col du Pillon - Scex-Rouge). Free parking at the Col du Pillon.